I don’t know about you, but I have a zillion layouts of my kids in their costumes, getting ready to trick or treat or to go to a Halloween carnival. What to do when Halloween scrapping gets a little too repetitive? Try a little twist to add a new layer of interest while still recording the holiday. We’ve got several fun ideas for you to try with photos you take this Halloween. Even if you don’t celebrate a Halloween birthday at your house, you could try this idea if you’ve made a Halloween banner. When you take down the banner, add some photos and captions (see how Kelly wrote directly on her photos or matted them and added captions to the mat? ), and pop it all on a binder ring for a quick and easy album. I’ve had a blast hosting Halloween week here at Write.Click.Scrapbook.! Here’s hoping we’ve inspired you to have fun creating this Halloween season! These quick and easy monsters, inspired by this cute project posted to the Write.Click.Scrapbook. Tumblr, were so darn cute I wanted to make more, so I did. Cut a monster head/body from patterned paper or cardstock (optional: round corners). Add eyes made using a small circle punch (white cardstock) and a hole punch (black cardstock). Add a nose made using the same small circle punch. Handcut some funky spiky hair and glue it to the back of the monster so that it sticks up from the top. Hope to see you back here tomorrow for the final Halloween week blog post, featuring fun and unusual ways to record your Halloween memories. and the giveaway goes to . . .
First, thank you, Studio Calico, for your kindness in providing a kit for this week's giveaway. We adore you and are so impressed by your work ethic, customer service, and kind community. Not to mention your terrific kits and products!! Perhaps the most practical request was for a self-cleaning house. Now that would be incredible. The request that brought a resounding Yes! was that the negative ads could stop. Amen! Congratulations to Andrea! We are happy to get you your Napa Valley kit, and perhaps the Great Pumpkin can drop that machine in your treat bag!! teehee! Please send your address to us at writeclickscrapbook at gmail dot com so that we may get you your kit. Don't go far as Vivian is up next with more Halloween fun! While the kids are dreaming of tricks and treats, what kind of treat would make you smile? How about a trip to Napa Valley? Or Mendocino? How about Santa Cruz? Sonoma? Monterey? we are thrilled to present the newest Studio Calico kit, Napa Valley. While you are oogling the Napa Valley kit, don't forget to check out the four add-on kits: Mendocino, Santa Cruz, Monterey, and Sonoma. They often sell out quickly, so strike while the iron is hot (or shall we say while the goblet is full?). Speaking of add-ons, did you know that once you have been a Studio Calico subscriber for a full year, you get 10% off your add-ons? And that all subscribers get their add-ons 12 hours early? Woohoo! No more sold out add-on kits!!! If you would like to be considered for this kit, please leave us a comment telling us what you would most love to have dropped into your pumpkin next to your Studio Calico Napa Valley kit. Have you a bonbon you prefer? Have you set your sights on a new pair of shoes? Is there a place you'd love to visit? Please share. And then don't forget to create a page to capture your current desires! And if a punch is on your want list, you may want to browse the Studio Calico selection. They are on sale!! Comments will remain open until 8:00 pm PST and one lucky number will be selected at random and posted tomorrow. Please remember it is your responsibility to claim your lucky number before midnight Saturday! Avoiding Halloween treats this year has already been challenging and we're still a few days out from the actual holiday! My office is filled with candy, bowls of candy are passed at meetings, and my children brought back lots of candy from last weekend's school Halloween carnival.Then there were the candy corn and jellybeans that were um, yeah, "props" for the photos I took for yesterday's blog post. I usually compound all of this sugar overload by baking pumpkin bread and spending an afternoon with my kids concocting some other kind of treat: caramel apples, Halloween cupcakes, rice krispie treats with Halloween sprinkles, etc. Thankfully, my kitchen goes under construction today so I will be able to avoid at least a few of the extra calories! There's only so much that can be done with a microwave, a toaster oven, and a crockpot. Do you take time to make, decorate, and document Halloween treats? If not, 2010 is the year for it! Today we'll get you into your kitchen and into your scrapbook space. Read on for ideas for making treats, decorating treats, and embellishing Halloween treat layouts. Okay, not so secret, as she’s agreed to share her recipe with us! To read more about Amy's cookie-making process, check out her recent blog post. How cute are these cupcake toppers Candice Palmer made? If you think they’re as cute as I do, it’s your lucky day, since she’s made them available for us to download! This simple layout by Jody Wenke gets its oomph from handcut candies elevated with dimensional adhesive. Jody cut her patterned paper to 8.5” X 11”, cut a few candies from the excess patterned paper, and then layered them over her background. I’d agree with Jody that that’s an impressive collection of Halloween loot! I opened up PhotoSheet, chose a 2 X 3 collage on a 4” X 6” background, and then added six digital patterned papers. I printed the collage on photo paper to get that caramel-like sheen, punched an apple from each square, and then arranged the five patterns I liked best on kraft cardstock “sticks.” Time to do this? About five minutes! Come back tomorrow for our weekly giveaway day and tune back in on Friday for more Halloween fun featuring quick and easy monsters! Candy corn, M&Ms, Snickers, Three Musketeers, Milky Way…let’s face it, one of the reasons people love Halloween so much is that it’s a great excuse to eat (lots of) candy! Today’s blog post is devoted to fun projects that will help you to package all that sugary goodness to give away to friends and family. An added bonus is that most of today’s projects will allow you to go green on Halloween by recycling packaging you likely already have at home. First up are these treat boxes I made from leftover plastic packaging (these were from adhesive, but lots of embellishments come packaged this way as well). I cut patterned paper to fit inside, adhered a chipboard kid-in-costume to the front, punched a hole in a chipboard candy corn, and tied the candy corn on with three different colors of baker’s twine. All that was left to do was fill the containers with candy! This would be a perfect little surprise to pop into a kid’s lunchbox or to use as a Halloween party favor. Next up are these cute jack o’lantern jars that Monika Wright made with her children. She started with glass jars (spaghetti, baby food, etc.) and then mod-podged orange tissue paper onto the jars. To finish the jars, Monika and her children added black cardstock eyes, noses, and mouths. These would be perfect to put out at a party, filled with candy! I also made a couple of quick and easy candy jars out of Frappucino bottles. I filled the jars with candy, cut a circle from patterned paper, placed it on top of the lid, and then folded it down along the sides. I punched a hole in a chipboard shape, slipped it onto a length of embroidery floss or baker’s twine, and tied it around the paper at the neck of the bottle. For the spider, I added an extra length of embroidery floss to allow it to dangle from the web. Stay tuned for tomorrow, when I’ll be back with Treats, Part II: Treat Layouts and Recipes. October is one of my favorite times of the year. I love the crisp fall air, bright blue skies, and the appearance of the multi-hued foliage that signals Halloween is right around the corner. In our family, we build up to Halloween with a series of October events. We peruse the costume catalogs that inevitably fill our mailbox. We make a scarecrow at our local fall festival and put him on display on our front doorstep. We pick a perfect Colorado fall day – 80 degrees with clear skies – and head to our favorite pumpkin patch where the snow-capped mountains are visible across the sea of pumpkins. We attend the elementary school Halloween carnival. We make Halloween treats; some years we bake cupcakes, other years we try something else, like caramel apples or chocolate-dipped pretzels. We carve jack o’lanterns. We make butternut squash soup. Finally, October 31st arrives and we head out for dinner and trick or treating with friends. I’m guessing many of you, like me, have Halloween traditions that you repeat year after year. Why not take time this fall to reflect on those traditions and create a layout or a mini-album? Several of us here at Write.Click.Scrapbook. have done just that! Stay tuned this week for additional Halloween fun, including treats, monsters, and more! Hybrid Everything - Minis, Invites and More! Good morning! Are you seeing the light at the end of the hybrid tunnel yet? 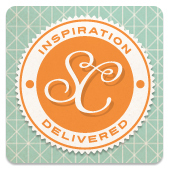 Today I am going to share a variety of non-layout projects that were made using digital elements. All of these projects use one or more of the techniques I've been highlighting this week. If you are into making mini albums, or other craft projects, you'll be interested to see what you can cook up when you add a bit of digi magic! After I felt comfortable working on hybrid layouts I decided to try using the process for making mini-albums. I discovered that it made the process a little less painful for me. I should confess at this point that while I love mini-albums, they aren't my favourite thing to make, because it does get repetitive. It's why most of my minis are only six to eight pages long! But with templates and hybrid I can make it go faster. All the pages were made using the template from Cathy Zielske that I linked to on Tuesday. Patterned papers are by Karla Dudley. Paula made this mini, using the Journal Card Brushes and Stamps by Cathy Zielske, available at Designer Digitals. After using the overlay on her 4x6 photos she printed them out and rounded the corners to make the pages for her mini. Here's another mini that I made recently, using photos from Kieran this summer. I used papers and elements from this summer themed kit by Jen Allyson available at Design House Digital. You can see more photos of the mini, as well as a tutorial on how I made it here on the Design House Digital blog. There's even more you can do with the hybrid concept. Kelly used a printable to jazz up her lotion bottle. You can find the rooster image, along with some others, here. She also used digital elements to create the invitations for her son's birthday party. She used a journal card from this kit by Echo Park to print the invite details, then mounted the printout onto patterned paper. When I wanted to make a notebook to record all the things Kieran was up to, I opted to use digital elements to make the cover. Supplies came from this kit and this kit. A tutorial with more details can be found here. What about non-paper projects? Paula and I were on the same wavelength and we both made t-shirts using digital elements. To create the t-shirts we created the design in Photoshop, then printed onto t-shirt transfer paper. There are really so many applications for this, and you can even do the same thing using printables! These are just a few of the ways that you can use your computer in your scrapbooking and other projects. Like I said before it is a lot of information, so just take it slowly, pick one concept to work on, and when you feel comfortable with it you can try something new! Also do please ask any questions you might have and I will do my best to help. I've also compiled a list of resorces, both links to free items, and links to tutorials, that you can refer to. The great thing about all this is that there is usually more than one way to get something done in Photoshop, so if my way doesn't click for you, maybe someone else's will. I've put all the links in a separate page. If you click here you can see the compilation. I hope that if you've been thinking about trying hybrid scrapbooking that something this week gave you the confidence to try it out. Remember you can show off your projects in the flickr group. I've really enjoyed being here this week talking about my new passion!